Located on the Atlantic Coast of Florida, Vero Beach is situated within a region that is often referred to as the Treasure Coast after treasure was discovered from a shipwreck of 11 Spanish fleets during a 1715 hurricane. While you may not find any lost gold when you travel to Vero Beach, you will discover many other treasures that range from beautiful beaches and fun attractions to arts and culture and great shopping choices. 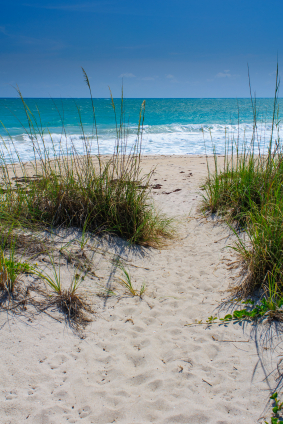 The beautiful beaches of Vero Beach offer sunshine, relaxation and fun water activities. South Beach is the most popular and main beach, while other good spots include Humiston Park and Jaycee Park, which is nearby Conn Beach. Additionally, the Indian River Lagoon is a favorite place for fishing, boating, water skiing and other water activities. Covering 18 acres, the McKee Botanic Garden is another popular attraction in Vero Beach where visitors can enjoy a pleasant stroll and enjoy beautiful landscapes, ponds and walking trails as well as a learning center, gift shop and restaurant. Founded in 1991 to shelter loggerhead and green sea turtles, the Archie Carr National Wildlife Refuge offers the rare and impressive experience of seeing these endangered turtles hatching and making their way to the ocean between May and October. Additionally, the refuge offers picnicking, swimming, bird watching and other wildlife viewing. Though a small museum, the Vero Beach Museum of Art is a gem that should not be missed. Here, you will discover a wide range of art works by local and national artists. In addition, the museum features an outdoor sculpture garden and offers various films, classes and workshops. The Royal Palm Pointe Park is a great place to cool off on a hot summer day. Situated in a lovely setting of palm trees, flowers, waterfalls and art works, this water park offers a huge play fountain to splash in as well as nature trails and a boardwalk for fishing or strolling. You can learn all about the history of the 1700s shipwrecks at the McLarty Museum. Constructed on the site of the salvage and survivor camps, the museum offers videos and artifacts that provide a wealth of information about the shipwrecks and the treasures that have been discovered. When you visit Vero Beach, you can also enjoy great shopping choices such as the trendy, upscale stores at the Indian River Mall. Featuring more than 90 retail stores as well as a food court and theater, the mall offers a little something for everyone. If you want to find a bargain, check out the Vero Fashion Outlets where you can buy name brand clothing at great prices. Whether you visit in summer or winter, you will most likely find pleasant weather though the area does experience more rainfall during the late summer. Additionally, you want to keep in mind that this area of Florida is a potential path of tropical storms during the hurricane season, which lasts from June to the end of November. No matter what your budget or preference, you can also find great hotel accommodation in Vero Beach. Online deals are just a click away. Compare prices today and secure a reservation, so your room will be waiting for you when you travel to Vero Beach.